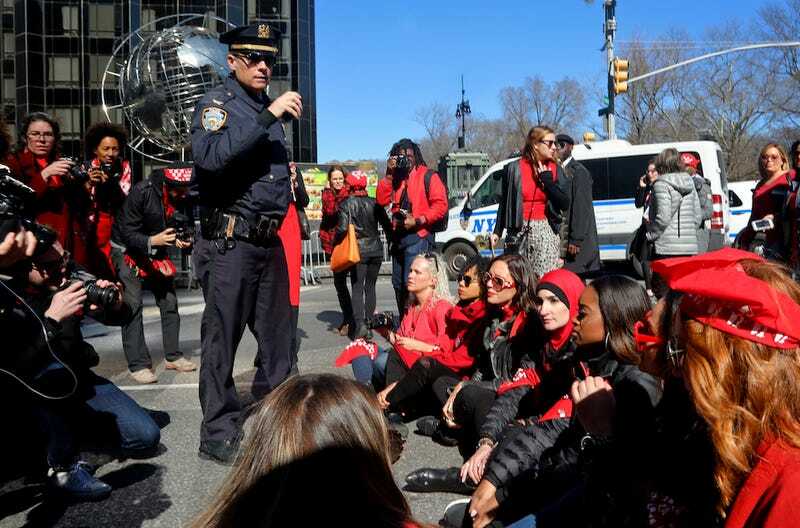 Thirteen members of the International Women’s Day Strike were arrested outside of Trump Tower in Manhattan this earlier this afternoon, according to the NYPD. According to the Huffington Post and Patch, the protestors began gathering at 1 p.m. at Columbus Circle and stopped in front of the nearby Trump International Hotel. A series of posts to the strike’s Twitter account show that organizers began deliberately blocking traffic in front of the hotel in an act of civil disobedience. Among those arrested, according to Mic, were Linda Sarsour, Tamika D. Mallory, Bob Bland, and Carmen Perez, all of whom were national co-chairs of the Women’s March on Washington. An NYPD spokesman confirmed the arrests to Jezebel, but declined to identify those arrested or specify the charges.